I've got a couple more Christmas candy recipes that you can use to make your holiday gatherings even more fun and memorable. These are both cute and fun, especially this first one for making lumps of coal. My dad used to tell us when we were kids, that if we weren't good, Santa was going to bring us a lump of coal for our stockings. Well, I've found an adorable coal candy recipe (and photo above) at Family Corner. It makes a delicious sweet treat that will give your kids a chuckle whether they're naughty or nice. Line an 8-inch square baking pan with foil, extending edges over the edges. Lightly grease foil with butter or baking spray. Combine corn syrup, sugar, and water in a heavy, saucepan (non stick is best). Stir over medium-low heat until sugar is dissolved and mixture comes to a boil. Continue cooking for about 15 minutes, without stirring, until a candy thermometer registers 290 degrees F.
Immediately remove from heat and stir in the anise extract and black food coloring. Pour mixture into your foil lined pan and allow the candy to cool completely. When candy is cool, lift it out of the pan using the foil. To break the candy into "pieces of coal," place it between two layers of heavy duty foil and take a hammer or mallet to it. Want to make this Christmas candy recipe even more fun? ...Now, how adorable is that?! Want some more chocolate candy recipes? Don't stop reading now! These white chocolate candy snowballs were on display at Family Fun. I love that site! Who doesn't like a good snowball fight? I have a feeling everyone will be reluctant to toss these snowballs away once they get their hands on them! Know what they really are? 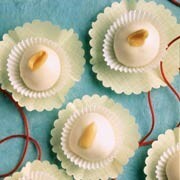 White chocolate peanut butter balls! Yum! The salty and sweet combo makes them extra special. You'll need two baking trays. Line 1 with foil and one with waxed paper. Combine peanut butter and butter in a large bowl until well blended. Blend in the sugar, 1/2 cup at a time, until smooth. Form the mixture into 1-inch balls and place them on the foil lined sheet. (You can dampen your hands to make it easier if the dough seems too dry). Let them set until firm (30 minutes or so). Melt the white chocolate and shortening using a double boiler over simmering (NOT boiling water). Be careful not to get any moisture in the chocolate or it will seize. If you prefer, you can also use the microwave for melting. Just stir every 30 seconds so you don't overheat. Dip each ball into the melted chocolate. You can use a toothpick to make it easier if you don't have a dipping fork. You can even spoon the chocolate over the balls to coat them, if needed. Place each dipped snowball on the wax paper lined tray. If you are using the peanut halves, place one on top of each snowball. Refrigerate until set, about 30 minutes. Store in an airtight container in the refrigerator. Makes about 4 dozen snowballs. So, what do you think? Do you like those Christmas candy recipes? There are plenty more recipes on our chocolate Christmas candy page for you to choose from, so enjoy!